We’re rapidly moving into a new era where advances in data, analytics and communications will make energy systems around the world more connected, intelligent, efficient, reliable and sustainable. The good news is that energy users – and that’s most of us – will be more engaged and participative in the market, as technology makes it easier to manage electricity, and simultaneously unlocks new ways to earn money from assets. Companies like Amazon and Apple have spoiled their willing customers with light-touch user experiences, and increasingly businesses will have expectations for fast and seamless experiences in energy as well. You might ask: Is my energy services company making the best use of digital technologies to capture the business opportunities emerging from the rapid digitisation of our energy system, and to meet the evolving expectations of customers like me? If you are involved in energy strategy, delivering efficiency/renewable projects, selling energy, or energy performance contracting, this post provides an introduction to plug-and-play the capability you need to run your energy services business better, and reach revenue faster. Open up exponential improvement opportunities. It’s no secret that digitisation can deliver big benefits for the business while improving the customer experience as well. My experience in Lean Six Sigma at GE confirms this, having seen projects delivering cost savings, and reducing the cycle time for delivering outcomes not merely by 10% or 20%, but by orders of magnitude. Lower the costs of delivering your services. Reduce the time to deliver insights to your customer, and get to revenue faster. Become more scalable: Unlock valuable people-time by using software automation to take care of the repetitive tasks. Find the gems in your data to deliver results, by using analytics, machine learning and Artificial Intelligence to do the heavy lifting. Enable your customers to participate in new energy business models. Improve your customer experience and differentiate your business. Wattwatchers has been tallying up the capabilities we can offer for energy services clients … and even we are surprised how much we can support right now, or have coming soon based on our partner recruitments. As you read on from here, think of it as a continuum of services, that can take you on a journey of expanding capabilities, as well as a menu that you can pick and choose from, starting from 1.01 and progressing to more advanced levels. Validate that your bills are correct, and optimise your electricity tariffs. Ten years ago there was huge returns in validating bills because retailers had such poor billing processes and frequently made mistakes. Now billing accuracy is much better and might deliver 2% savings a year. Validation is an essential part of a financial risk management strategy for businesses, but more needs to be done to make significant cost savings. For years, tariff optimisation has been performed by consultants manually in spreadsheets. Now software is making it easier to use your interval data to compare the hundreds of tariff options available and select the best one. Automate utility billing to your customers, and improve the mini-utility customer experience. Embedded Network Operators and microgrid operators are often streamlined businesses wanting to do things differently and many are focused on improving their customer experience. Managing an Embedded Network requires tools to support a range of activities, including; roll in/out of tenants, mobilisation of field forces, new customer enrolment, compliance reporting, network management, and billing for multiple services including electricity and hot water. Embedded Network operators are frequently looking for ways to improve their customer experience; making it easier to pay, giving customers tools to manage energy, opening pathways to premium upgrades for home automation, and more. Software and IoT technologies combined are bringing all of these areas together, reducing the need for truck-rolls, improving the customer experience and automating processes to speed up delivery. Nudge customers to take action on energy, and reduce the time you spend on project quotations. Quoting efficiency/renewables projects and presenting business cases is core business for energy services companies. Summary business cases based on real data can be used to politely ‘poke’ customers to take action, drawing on sophisticated analytics that automatically compile energy project business cases based on real interval data, tariffs and technology pricing in the market. Wouldn’t it be nice to grab a coffee while the quote gets done for you, so you can spend less time quoting and more time selling and delivering? Streamline Measurement & Verification (M&V), and make your projects more profitable. Effective M&V requires significant amounts of data management, which usually occurs manually in spreadsheets, and third-party review of the analysis also is required. Real-time tracking of project ROI and performance is the nirvana, and Wattwatchers is quite a way down the track towards that. The right software has the potential to provide a single source of truth for multi-stakeholder review, and for automating data capture and processing. Not all M&V solutions are created equal, and we are seeing a few specialities emerge. For example, customised M&V for project-based services in many industries i.e. data centres, Residential, and large property portfolio M&V. Automate building performance management and business reporting processes for your customers. Manually reporting across a building portfolio on utility spend, sustainability reporting, energy and water projects, and building ratings can be very time consuming and onerous, so software to automate data capture, crunch the numbers, and provide live performance dashboards to multiple stakeholders can wow customers. Platforms need owners to administer them and ensure that the data is correct. As a service provider, automating the reporting as much as possible frees up your capacity to deliver the insights. Reporting schemes including NABERS, GRESB, Green Star and Energy Star can require the separation of tenant consumption, for which cost-effective IoT monitoring is ideal. It can be easy to get quick wins by measuring exclusion rather than estimating as an example. For no additional charge, Wattwatchers can put a basic dashboard in the hands of your tenants to help them manage energy and make savings of their own. Boost the performance of assets to improve value, lower costs and improve reliability with AI, machine learning and advanced analytics. Monthly billing data isn’t enough to deliver deep efficiency savings. It’s similar to just reading a newspaper headline and trying to develop a strategy to address the root cause of a complex issue. Conversely, when you have high-intensity interval data, plus data from many sensors, then building a scalable business demands more sophisticated analytics to help identify anomalies and determine where to focus. We’ve been assembling Software-as-a-Service (SaaS) partners to help address businesses of all types and sizes from SMEs, to government-owned, to large enterprises, because we know requirements change with the scale and complexity of a business. Most companies use billing data to monitor building performance, but helping manage buildings day to day rather than month to month helps you to keep building performance on track. Track intensities, indicative building ratings, weather-normalised performance and more. In commercial buildings, HVAC systems typically consume 40-50% of the building’s energy, and getting granular monitoring which includes voltage and power-factor down to the equipment level helps to drive asset performance optimisation. Using traditional metering technologies can blow the budget. Laying down Modbus cabling quickly becomes expensive, as does using networks of routers and switches to enable a building for monitoring. Wattwatchers can help lower the cost of installation by using wireless communications and multi-circuit monitoring to reduce the cost by up to 60%. Real-time data plays a role helping to address a big performance detractor at many sites – demand charges. The regulatory system in Australia has commercial property owners flying blind on the day of predicted peak-load events. Wattwatchers helps to understand building peak load, with tracking by the minute rather having to wait until the next day. Similar to commercial HVAC, industrial refrigeration systems can be large energy consumers with bills in the millions of dollars per annum, and have complex systems. Analytics can help to identify optimisation opportunities by analysing sensor data and identifying operational anomalies. Enhance industrial productivity by understanding real-time efficiency of assets, and the real inputs to your manufacturing process. The electricity signature of a plant item can tell you a lot: hours of operation, start/stop cycles, and how much work the equipment has done. Electricity is such a valuable piece of the manufacturing/industrial optimisation puzzle, which means that often we are seeing Wattwatchers solutions being used for fast deployment of real-time electricity monitoring as a first step, and then combined with other data. When combined with data from SCADA and production systems, for example, industrial customers can leverage insights from real-time operational efficiency, get asset efficiency metrics for a plant item, understand the material and energy cost per SKU/Shift/line, identify incorrect control strategies, determine the remaining useful life of an asset, and predict maintenance and failure. IoT solutions can be deployed swiftly in focused areas like energy, offering flexibility and customisation in the way data is visualised to deliver insights, and rolling up data across portfolios – which has been very difficult and expensive under traditional models. Automate building and asset control with cost-effective energy IoT retrofits. Smaller buildings under about 3-4,000 Sq meters have traditionally been underserved by buildings controls companies because solutions are too expensive and the business case doesn’t stack up … but these smaller buildings account for the majority of the world’s building stock. There is an opportunity for technology solutions at the right price point to eliminate energy wastage and make buildings more comfortable and convenient with smart automation. 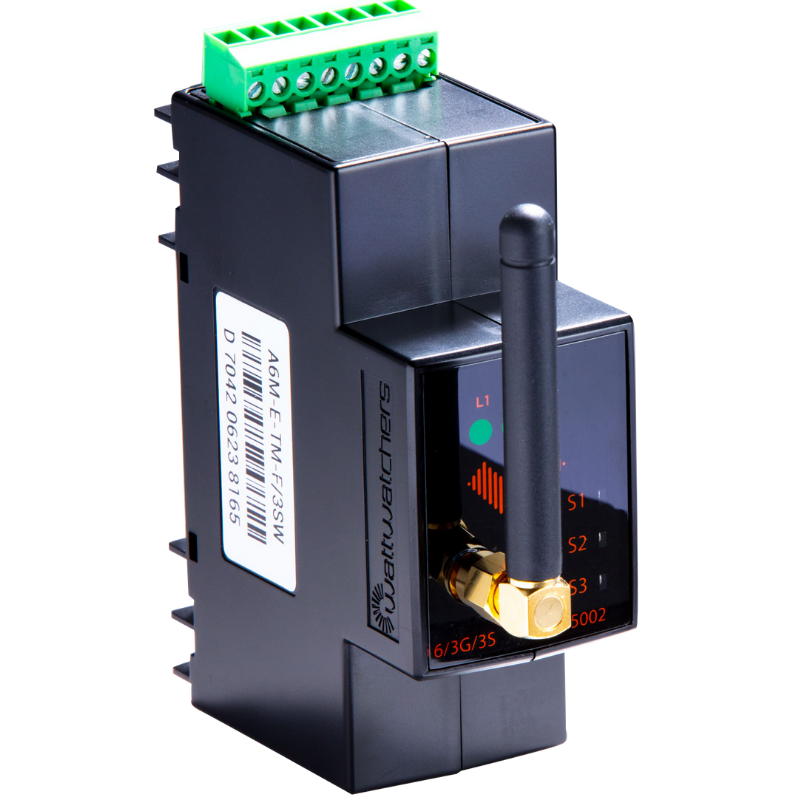 A wireless IoT solution has a massive cost advantage over traditional cabled solutions for retrofits, reducing the installed cost for energy monitoring and switching control by up to 60%. 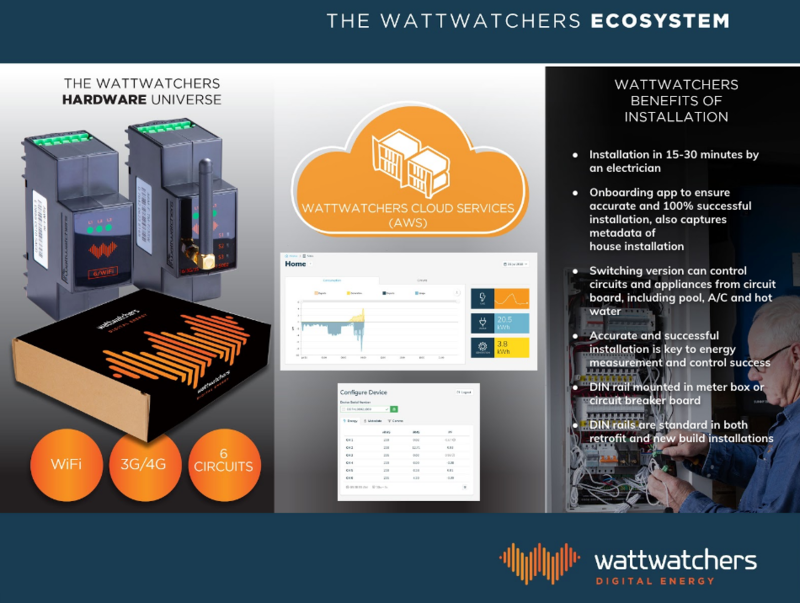 Wattwatchers has combined real-time monitoring and switching functions into a compact IoT device, and we use partners for more sophisticated control. The most common form of energy wastage is after hours usage of electricity. Nip it in the bud and schedule key loads like A/C, lighting, signage etc to turn off after hours. Get rid of those old mechanical timers that are never quite in sync at daylight savings time. Retrofit SME building automation: lighting A/C, media, hot water, occupancy and more. SME businesses can access a cost-effective control retrofit that can start as an automated energy management system (EMS), ensuring you make the best use of your solar generation, and expand into an automated system that controls lighting and temperature based on occupancy and temperature sensors. As voice activation improves, you won’t even have to clap any more to make things happen – just talk! Remote asset control from anywhere. Remote switching of an asset like an irrigation pump isn’t a new thing, but combining it with monitoring and lowering the cost has been a big innovation, making control through the internet more accessible wherever you have distributed assets that you want to monitor and switch. Deliver new energy business models to your customers. Enable your customers to participate in new energy business models to unlock new value pools and push the innovation boundary. Deliver unique solutions and improve the improve customer experience. Real-time monitoring at the circuit level, with +/- 1% accuracy, underpins demand response and distributed energy trading. Behavioural and automated demand response are supported by Wattwatchers technology and partners. Wattwatchers is one of the first companies to be integrated with the world-leading Distributed Energy Exchange (deX) which creates a marketplace for trading distributed energy resources (DER) capacity, across the entire electricity value chain at a smaller scale than previously possible. *James Clements is a business development manager with Wattwatchers, specialising in commercial and industrial sector applications. His CV includes stints with Envizi, AGL New Energy and GE.